FreeHand: The pocket for the back of your hand. The pocket for the back of your hand. Have you ever struggled to find a place to store your keys, money, or phone once you've thrown on your workout clothes? 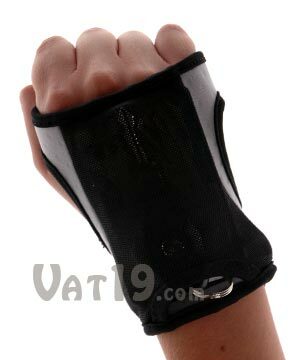 Struggle no more with the FreeHand Workout Glove, the comfortable, neoprene pocket for the back of your hand. The FreeHand's flexible mesh pocket can safely store your keys, your BlackBerry, and everything in between while you work out. 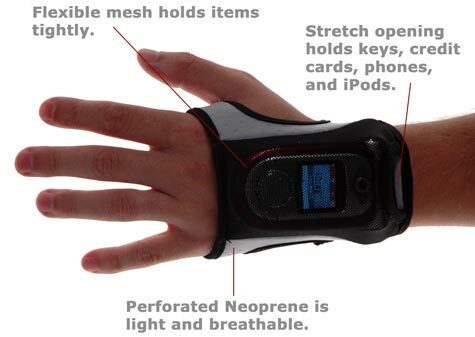 The FreeHand Workout Glove is an ingenious pocket for the back of your hand. No longer do you have to try to store a few bucks in your sock or suffer through the jangling of your keys while you go for a run. The FreeHand is great for bike riding, too. It is much cooler, we argue, than a little basket in front of your handlebars. Keep the streamers, though. They're always fashionable. 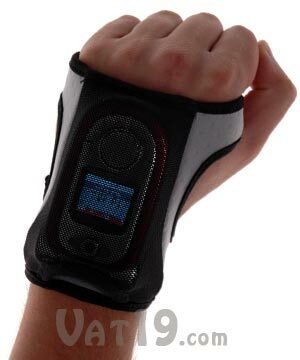 The stretchable mesh of the FreeHand Workout Glove can expand wide enough to hold a BlackBerry, Treo, and video iPod classic. It also contracts with enough force to safely hold smaller items like keys and credit cards during the most strenuous of activities. The FreeHand Workout Glove can hold all of these items. Of course, it can't hold all of them at once. Generally speaking, the Large FreeHand is designed for men and the Small, for women.